Boost your immune system and slow-down premature signs of aging with every cup of rooibos tea. 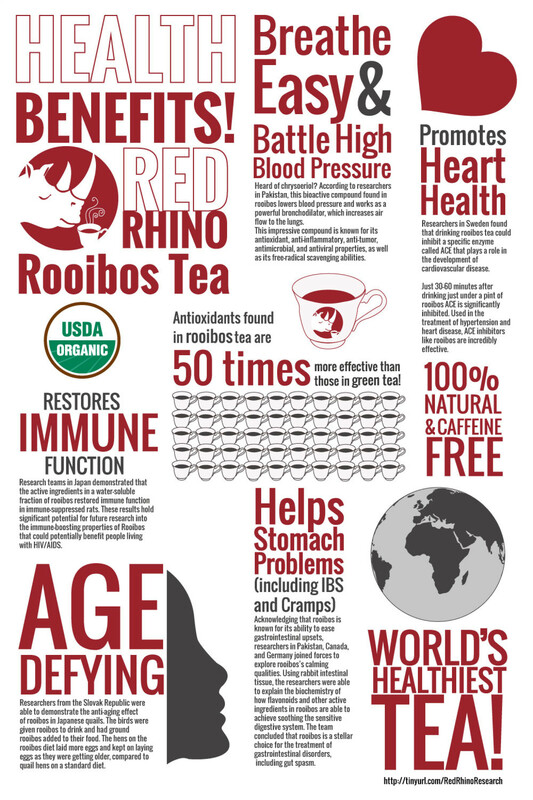 The health benefits of rooibos tea are many. So many in fact, that it appears to be an all around remedy for most any ailment. It seems to help with almost anything, from headaches, insomnia, and irritability to cancer, heart disease, and premature aging. Grown in the majestic Cederberg mountains of South Africa, it has many of the same health benefits of green and white teas without the caffeine and high tannin content. Being caffeine-free means you can drink it all day long and even give it to babies instead of water, because it contains some anti-spasmodic properties. It is high in antioxidants, which fight free radicals, helping to keep your body healthy and strong. This wonderful beverage now comes in several different flavors—vanilla, mint, chamomile, caramel, and tiramisu. From quenching thirst to calming hyper children, the benefits of rooibos tea are too many to be ignored. Rooibos (meaning “red bush”) had been used for its health benefits for hundreds of years by the Khoisan of South Africa before it was discovered and described by early Cape-Dutch settlers in the 18th century. In 1904 a Russian immigrant Benjamin Ginsberg started trading with Rooibos tea, marketing it as a “mountain tea,” an herbal alternative to the traditional black tea. Attempts have been made to grow this herb in similar geographical regions of the US, China, and Australia, but without success. It seems to grow only in one particular corner of South Africa, the Cederberg Mountains, about 200 km north of Cape Town. Rooibos is available as red (original) or green rooibos tea. The red variety tastes better, but the green rooibos contains nearly two times the flavonids and 10 times the antioxidants that red rooibos does. Its increased levels of nutrients and antioxidants makes it the more popular of the two varieties. The difference in color is the result of fermenting process. When rooibos leaves are oxidized, they turn a reddish-brown color. When left unoxidized, the leaves remain green. Although people refer to rooibos as tea, it's technically a tisane. Tisane is a “herbal tea,” a caffeine-free infusion of a plant not containing any stimulating ingredients, like the black and green teas do. Tisanes (chamomile, mint, cinnamon, ginger, rooibos, etc) have traditionally been used for medicinal reasons and, being caffeine-free, are safe to drink any time of day and night as they do not interfere with sleep patterns. In fact, it's recommended to have a cup of rooibos tea before going to bed because it's considered to be a very efficient natural insomnia treatment. Rooibos is also good for relieving stress and nervous tension, as it is able to lower the production of stress hormones. A cup of rooibos tea is a great way to relax and unwind after work. Benefits of rooibos tea are particularly important for those suffering from kidney stones. These patients are not supposed to take either black or green tea because they contain oxalates, which is what kidney stones are made of. However, rooibos tea, being oxalate-free, is safe to use even by kidney stone sufferers. The therapeutic properties of rooibos (anti-carcinogenic, anti-mutagenic, anti-inflammatory, and anti-viral) are due to the herb's polyphenol content. Polyphenols are compounds known for their antioxidant activity in the body. Rooibos tea has up to 50 percent more polyphenols and antioxidants than green tea and can be used as a healthy, caffeine-free alternative to green tea. Rooibos contains a complex blend of powerful antioxidants which fight free radicals, preventing them from damaging cells and causing cancer. It also contains two compounds, namely aspalathin (found nowhere else) and nothofagin (only found in a beech tree in New Zealand) which help with the treatment of Parkinson's disease, muscular degeneration, and many kinds of cancer. The anti-inflammatory properties if rooibos help prevent heart related illnesses and offer a natural remedy for hypertension. Regular consumption of this tea helps lower the blood pressure and keep it under control. In addition, promoting the good cholesterol and inhibiting the bad cholesterol, rooibos protects against atherosclerosis, blood clots, heart attacks, and strokes. The anti-viral properties of polyphenols provide an added boost to the immune system, which helps protect the body from common colds, viruses, and the flu. To boost the tea's antioxidant properties, try making a cold infusion. Steep the tea in cold water and leave it to brew for 12 hours. It has a different, and in my opinion superior taste to that of the warm tea. In summer, you can drink cold infusion rooibos tea instead of water. Rooibos tea is rich in minerals, particularly calcium, manganese, and fluoride, which, combined, help build strong teeth and bones. The amazing thing is that rooibos contains a lot of calcium, but it's also rich in magnesium which helps us absorb that calcium. Both these minerals are vital for healthy development of our skeletal system. Calcium supports strong and healthy bones and teeth, while manganese stimulates enzymes which are needed to build more bone mass or repair damage. Fluoride, on the other hand, is necessary for healthy teeth because they lose minerals when bacteria and sugars in the mouth attack the enamel. Fluoride prevents tooth decay and should be replenished through food or water. This is why fluoride is found in most toothpastes and mouthwashes. Fluoride supplements are available as tablets, but one of the benefits of rooibos tea is that by regularly consuming this beverage, you get enough of this important mineral when consuming it in a natural way. Rooibos is rich in antispasmodic agents, which help the digestive tract by smoothing out muscles in the gut. These agents can ease severe stomach cramps and abdominal pain. In case of digestion problems, this tea can help if taken 30 minutes prior to a meal you suspect you'll have difficulty digesting. The tea is also known to help with irritable bowl syndrome. Rooibos tea is safe to give to infants. Simply add some tea to a sweetened milk to improve the taste. It is known to help babies' digestion by relieving colic, diarrhea, vomiting, and nausea. There is also a baby rooibos tea, an anti-allergenic and nutritional drink which helps prevent skin rashes and sensitivity. Some doctors even recommend that juices and water be replaced by baby rooibos tea as a nutritional supplementary drink. Rooibos tea is rich in alpha-hydroxy acid and zinc, both of which are great for the skin and are known to help with acne and sunburns. Alpha-hydroxy is a component of many commercial cosmetic products used for reducing the premature signs of aging. Zinc is also vital for a healthy skin as it has anti-inflammatory properties, protects against UV rays, heals wounds, and helps build cell membranes. By drinking rooibos tea you get alpha-hydroxy acids and zinc not from chemicals, but from a natural source. Combined in rooibos tea, these two ingredients help improve your skin tone, reduce wrinkles, and slow down the aging process. Another way of helping your skin stay wrinkle-free and radiant is applying some rooibos tea powder directly to the skin. This is known to help with acne and will soothe the skin after sunburn. There is also redbush soap, made from mild and non-drying ingredients and containing rooibos tea leaves powder which is suitable even for the most sensitive skin types. Benefits of rooibos tea are best enjoyed from both within and without—as a healthy beverage, a nourishing face mask, or a gentle soap.